jason and jesse at s.f. 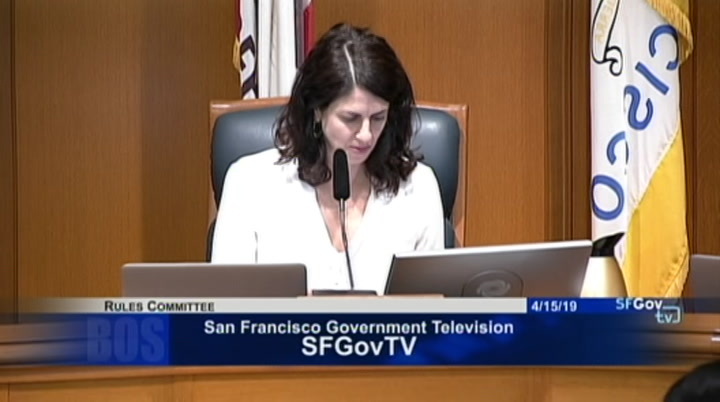 gov tv for staffing this meeting. >> please silence all cell phones and electronic devices. all documents should be submitted to the clerk. 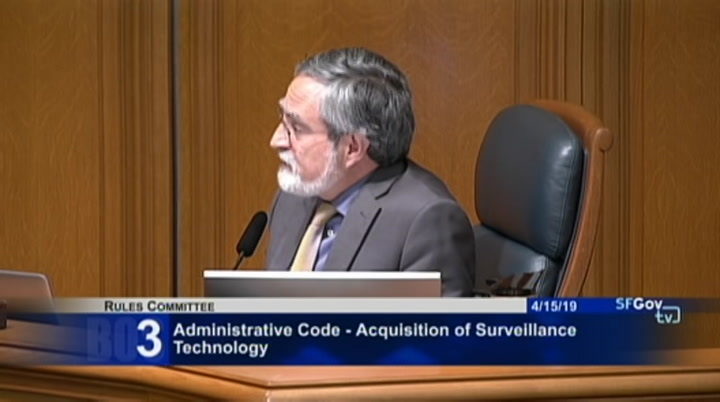 items actor upon will appear on the april 23 border of supervisors' agenda, unless otherwise stated. >> chairwoman: we have received a request to move item four to the top of the agenda. 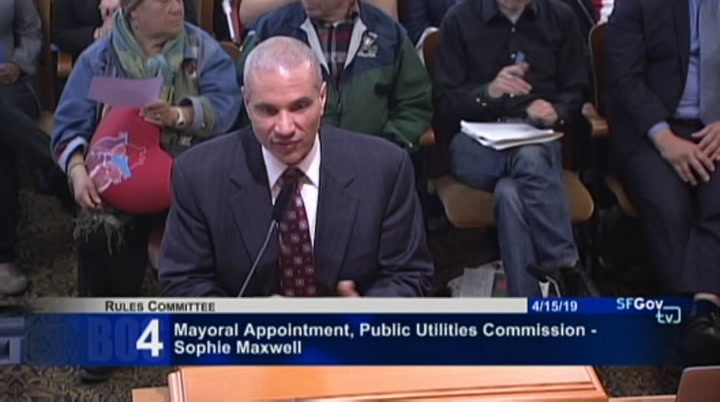 i thought i would therefore take four and five, which are both mayoral appointments to the public utilities commission. first -- is that okay? can i have a motion to move items four and five to the top of the agenda. so moved without objection. 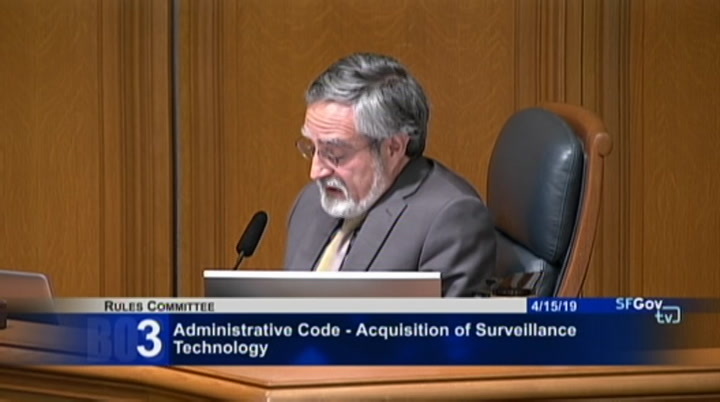 that motion passes. >> and can you please call item number four. 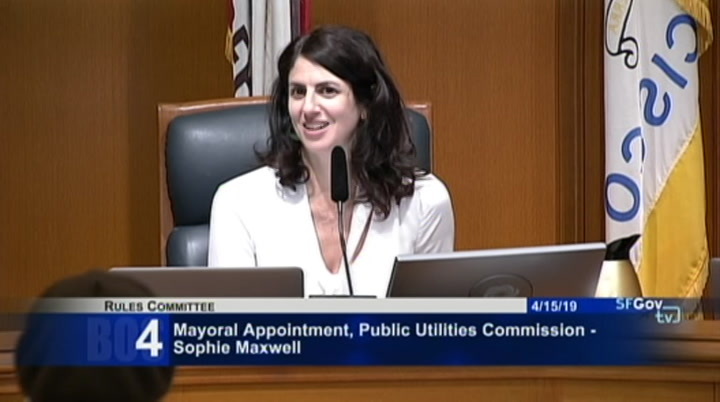 >> motion approving rejecting sophie maxwell to the public utilities commissioner for a term ending august 1st, 202.
for your support. any questions? >> chairwoman: thank you so much. i had a couple of questions. do you have a question, supervisor? 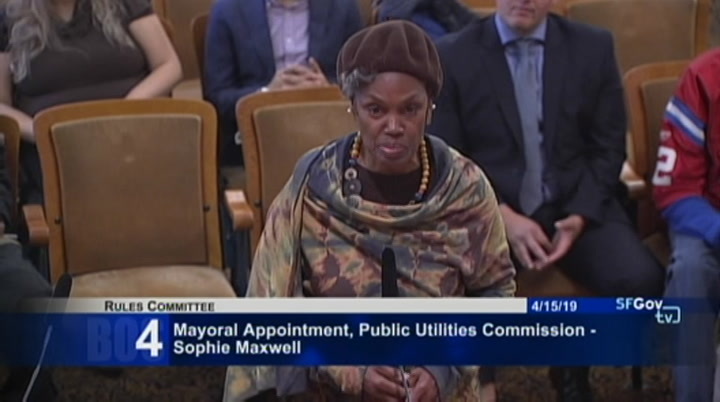 [inaudible] >> chairwoman: first of all, i want to say in my opinion, brilliant appointment on the mayor's part. 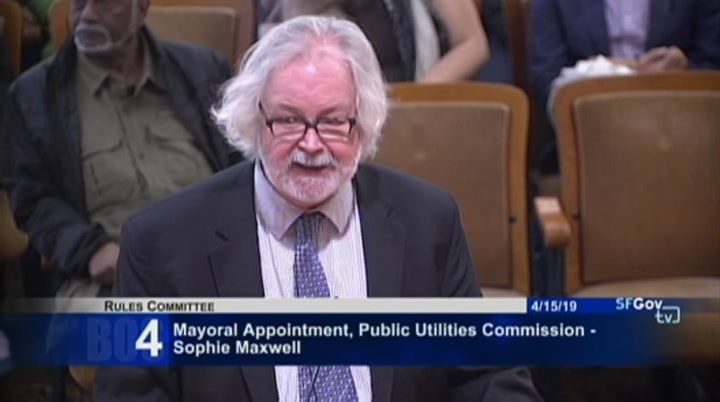 the fact that you worked your entire career to, you know, redesign the sewage plant, and now get to getting to see that project through through the position of the p.u.c. is incredible. i can't think of a more qualified and knowledgeable person to see that project through. so i'm super excited. i just wanted to ask you a little more. as you know, i've been working with several of my colleagues on the board with p.u.c. 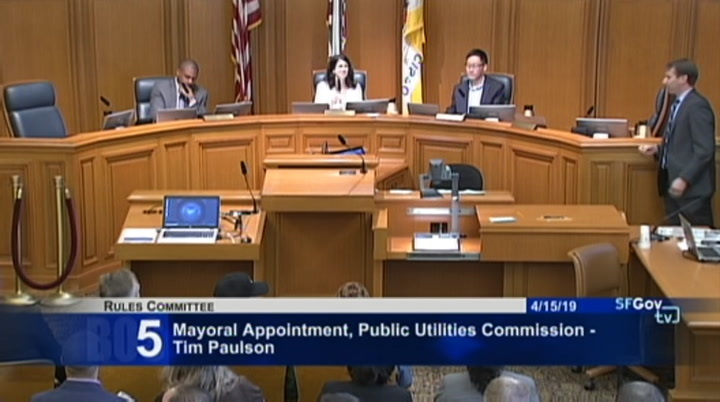 staff and the mayor to break our ties from pg&e, and to transition to green, renewable, publicly-owned system. so we know about generation. and i think this is a prime opportunity, and employees will be better off with san francisco because it is not driven by money and by profits, but it is driven by the utility and by the importance of the utility. so i think that the -- they will be better off. i think the city will be better off. 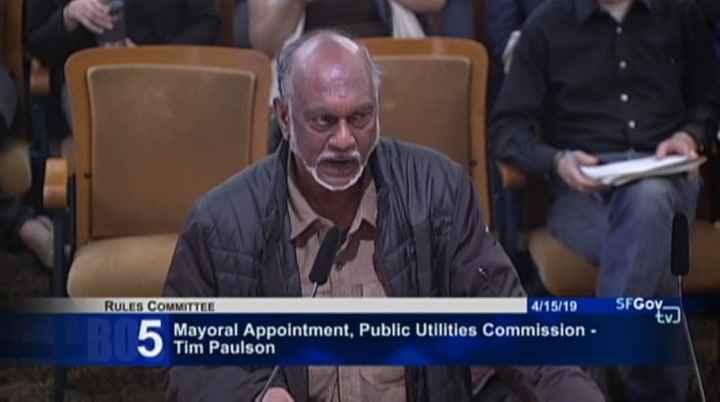 if you look at there is an alliance of public power cities, cities that have public power. 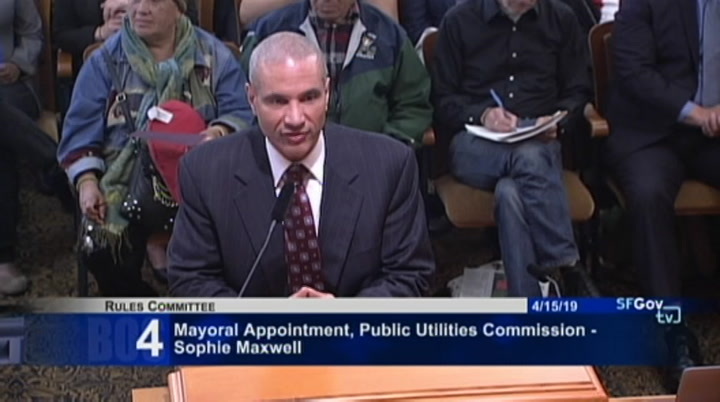 and if you look at that alliance, public power in every single account is less than what pg&e charges. so i think will be better off, and that money that we get, because, you know, it is revenue-generate, we can build underground in places that are important and that are sensitive to fire. i think the employees will be better off. we probably will need more and better -- more employees. i think there are opportunities. sat on them. 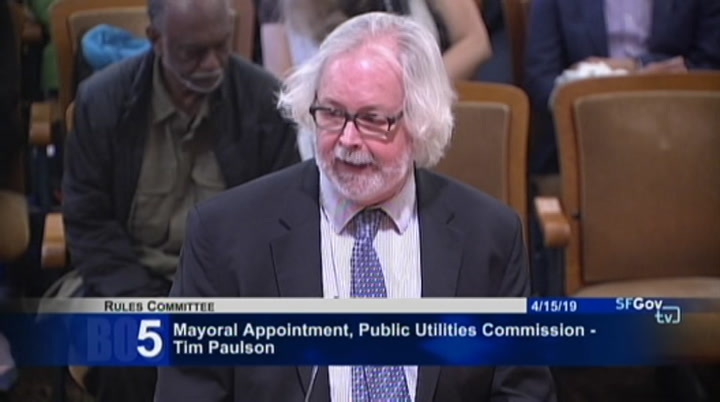 but when the mayor called and there was an opening that was a labor seat apparently on this commission, i was recruited to fill that position. 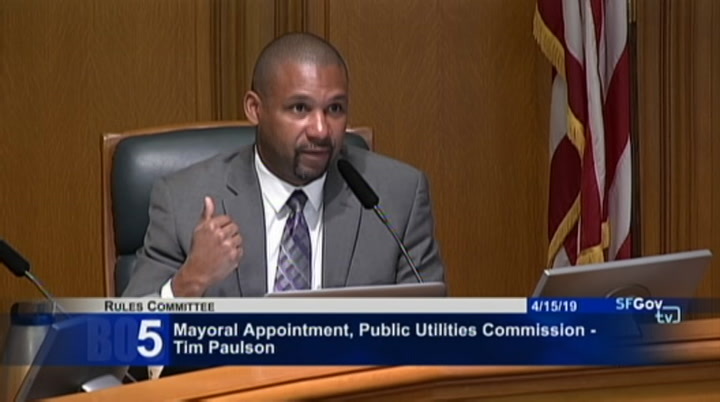 i want to let you know, supervisors, i will be honored to serve in that capacity. 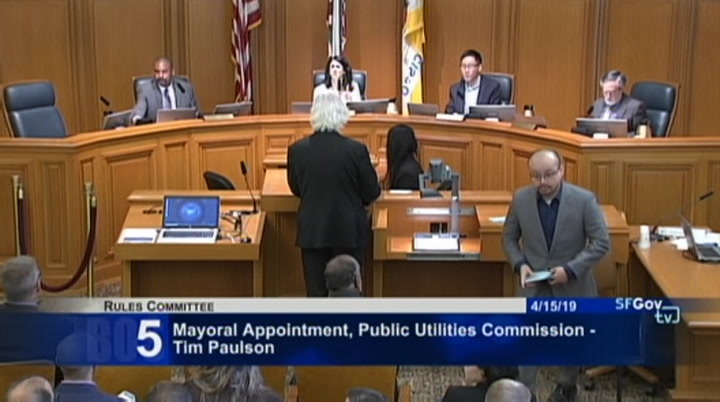 the public utilities commission is one of the most important infrastructure commissions and all commissions in san francisco. i'm going to take the job incredibly seriously. 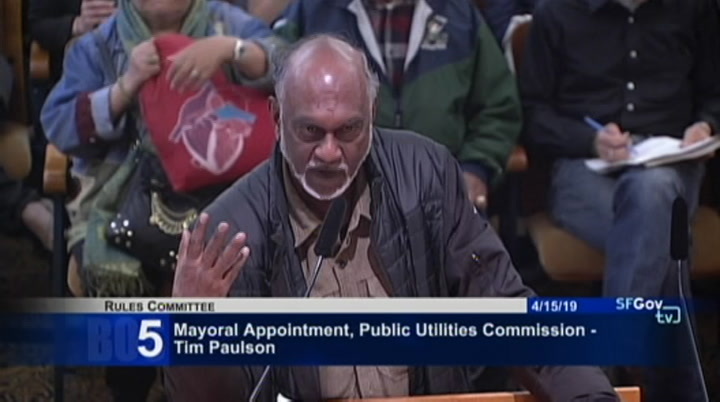 i want to let you know i'm intimately aware that this is a position where policy is indicated, and it deals with our water system, our sewage system, you know, the stuff that is going on in the electrical system right now, and i'm going to take that incredibly seriously. i'm going to advocate for workers. 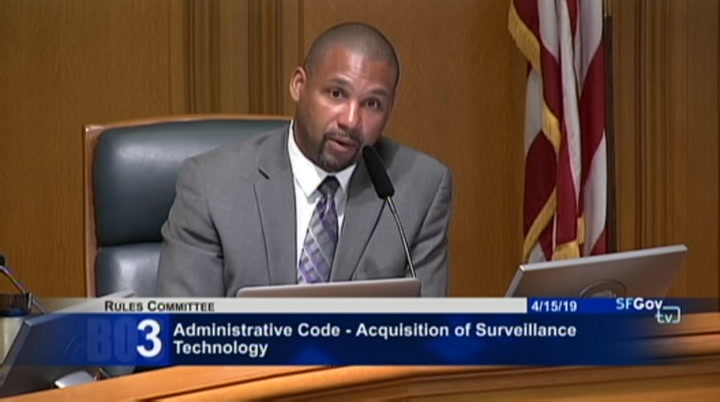 i'm also -- as well as i'm going to advocate for the residents and the businesses of san francisco, to make sure that they get the service that they need to make sure that the city continues to work. right, and all of the intersections that the p.u.c. is doing across the city, and how that benefits the community, and what those benefits should be. 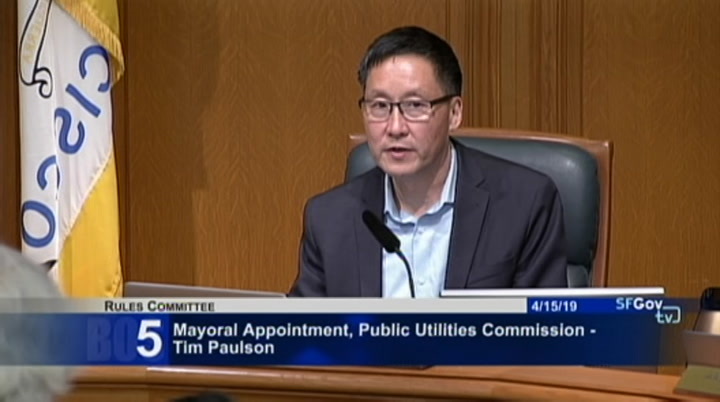 i'm excited to have you willing to step up and be on board and i'm looking forward to your work on the commission. >> thank you very much, supervisor walton. 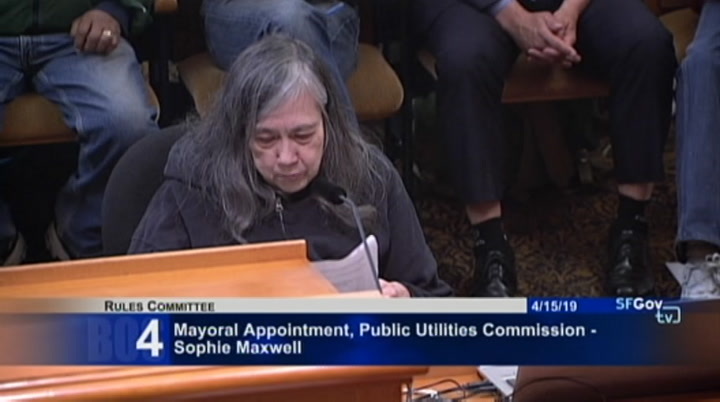 >> chairwoman: thank you, supervisor mar. before you start your questions, if anyone is standing, if you could try to find a seater. seat. 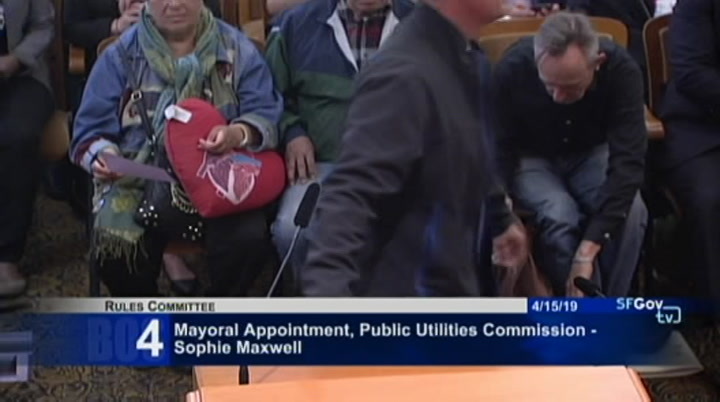 i know the sheriff will probably be here shortly and ask you to go into an overflow room if you're not seated. and i do see a bunch of open seats. so please have a seat. 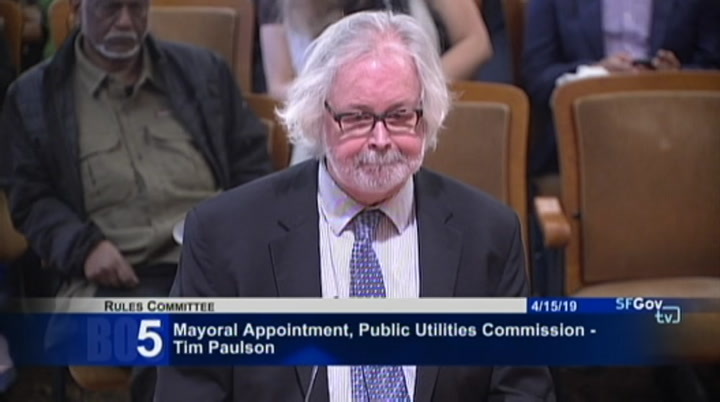 >> i just wanted to echo supervisor walton's comments and really thank both tim paulson and sophie maxwell for all of your commitment and leadership and dedication to our city. 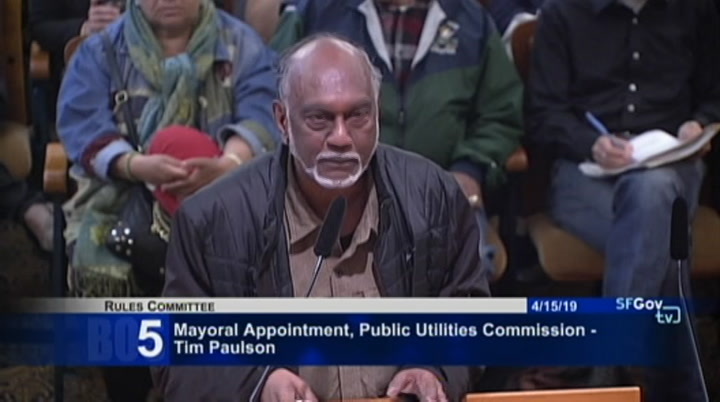 and your willingness to serve on the public utilities commission. underground, instead of over ground, over the heads of citizens, and also having them right along the lines of force and combustible materials, such as forests and parks. >> chairwoman: thank you so much. any other speakers on this item? seeing none, public comment is closed. i did see general manager harlin kelly come into the room. mr. kelly, did you want to make any comments? 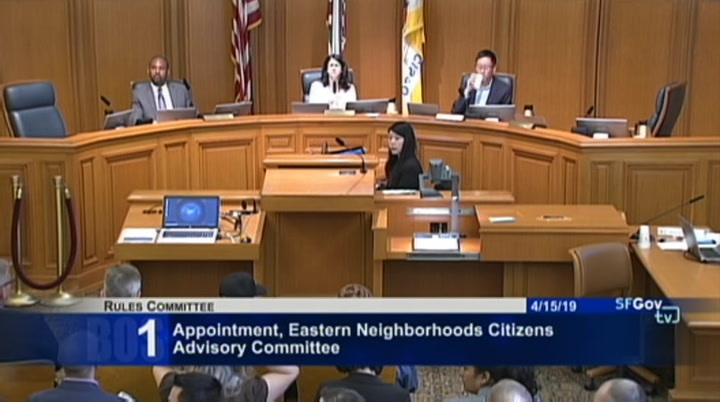 [inaudible] [inaudible] >> chairwoman: i have never had -- i wonder if there is a chair that we could put -- okay. 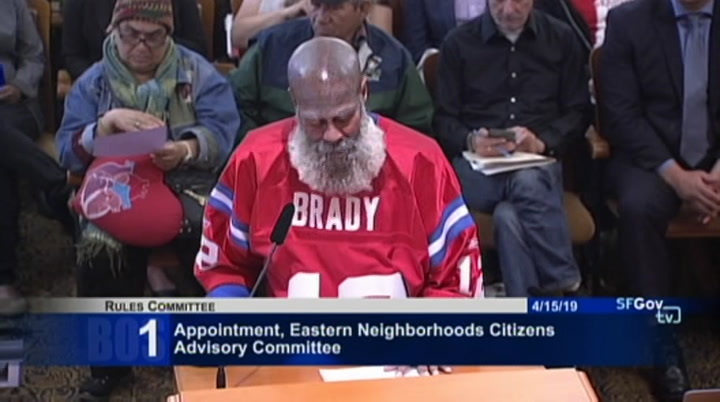 first let me entertain a motion to reopen public comment. >> so moved. the help. >> hi. my name is jean buchanan. 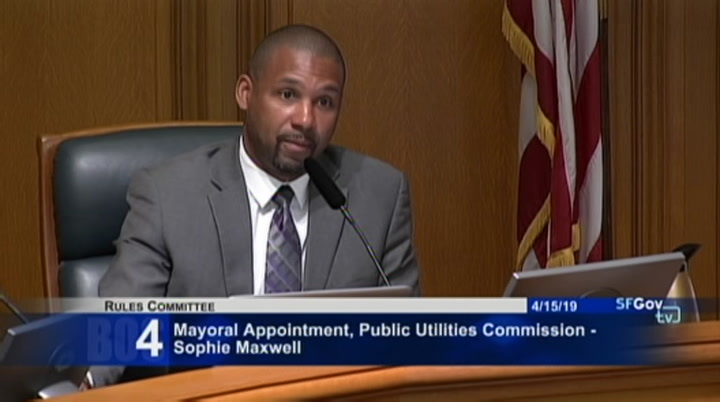 i asked the committee to reject the mayor's appointment on commissioner sophie. 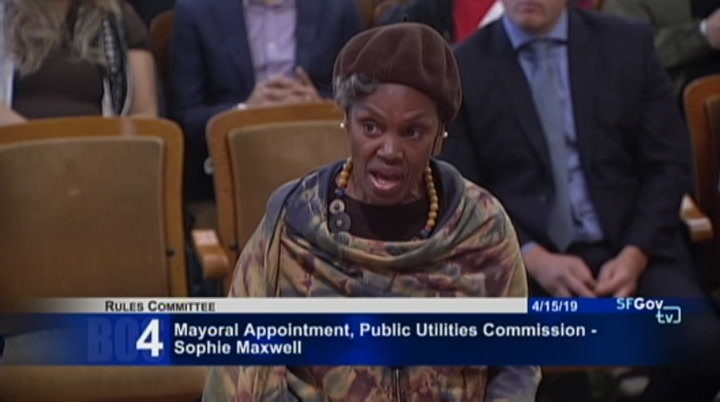 i argued to reject the mayor's decision, and an informed decision -- >> chairwoman: excuse me. choose mexcuse me one moment. this is a different item. the item you're talking about is item number six. and we're on items number four and five. so if you want to stay in that chair, and if we could make some room for you, and when that item comes up, we'll call you to come up and speak. okay? thank you. >> okay. >> chairwoman: okay. sure. thank you so much. thank you. good morning. thank you. [inaudible] [inaudible] >> chairwoman: thank you so much. i appreciate it. any other public comments? >> i'm joh john corso. i'm a san francisco trades building member. 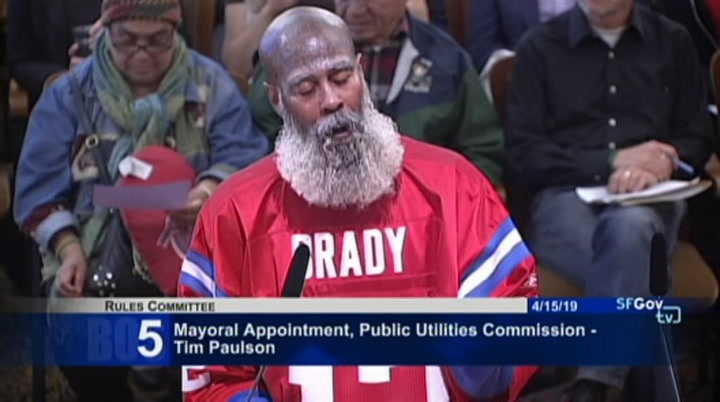 i'm here speaking on behalf of tim paulson. i think tim would be great. i believe he's a great labor man. i believe this has been a labor seat for long time. i think we should keep it that way. and we're all behind tim. thank you. 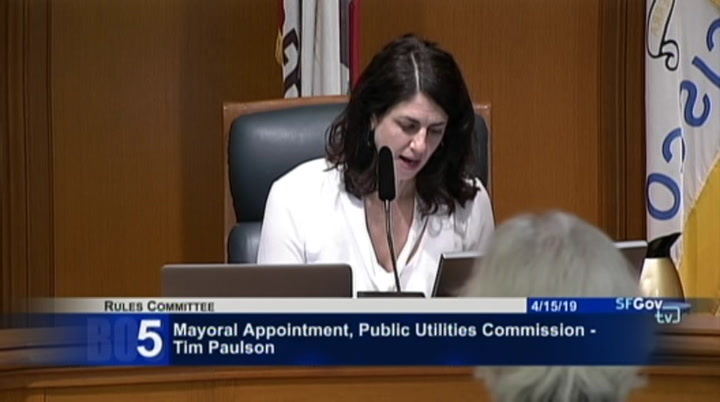 >> chairwoman: thank you so much. very strong leader. and i think the fact that we have a total of $12 billion on our 10-year capital plan on water, waste, and power, and we have the largest water agreement in the nation, that it just makes sense that he be part of the commission and help steer and guide us on how we're going to deliver these projects on time socio-i so i wanted to thank the board for the positive recommendation. >> chairwoman: thank you so much. 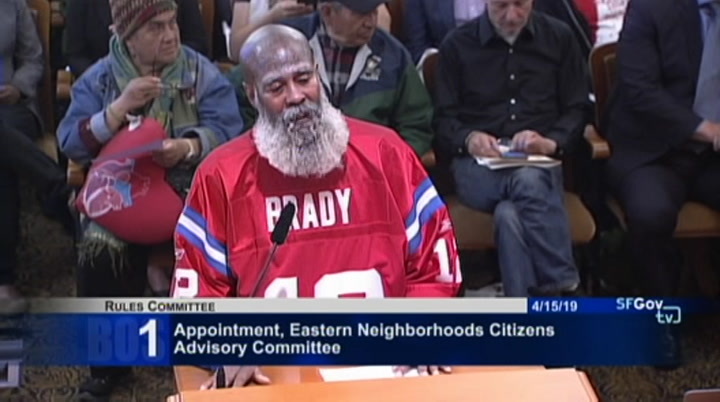 it looks like we have a lot of enthusiasm up here for these appointments. anybody want to make the motion? 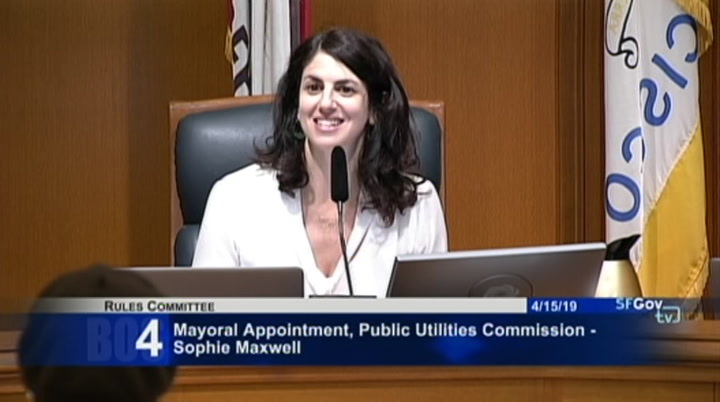 >> i move to approve the appointment in items four and five, and move forward sophie maxwell and tim paulson for public utilities commission. 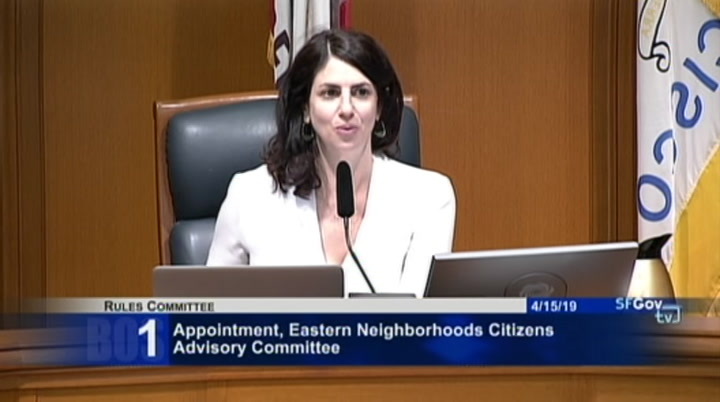 >> chairwoman: without objection, those motions pass. thank you. thank you so much. per three stories. 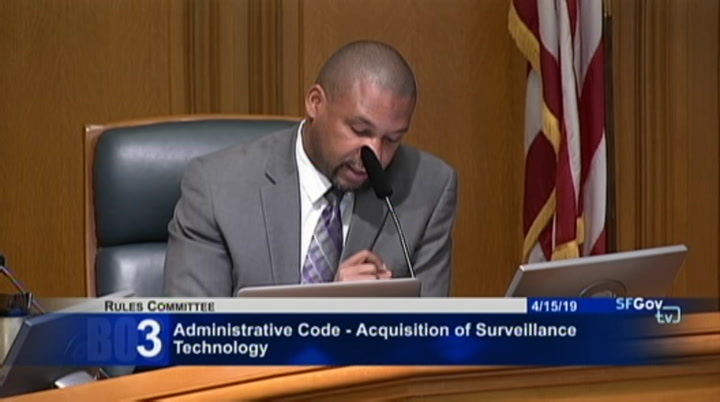 we have a homeless problem in the area of the embarcadero, and there a proposal to build a navigation center there. nine times three is 27, and you could build a 27-story tower in that area down there and get a bigger bang for your buck. 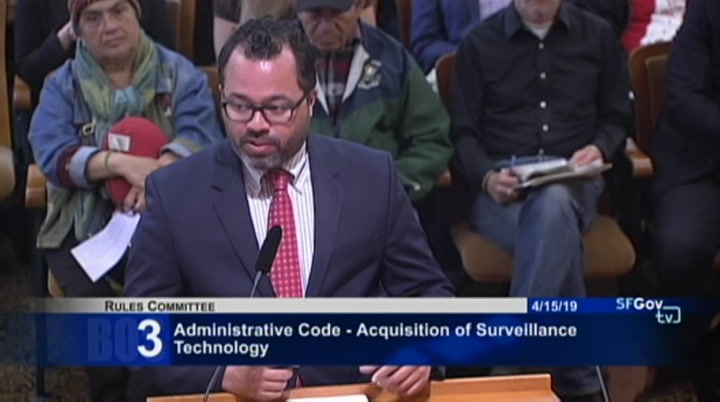 and as a result, there is additional departments within the city who are having problems keeping track and providing the services that they've been assigned to. the public defender's office, district attorney's office, 850 lions street. as a result, they keep losing contact with the people they want to help because these people have no place to live. by using this technique i'm offering to you, you can house these people permanently instead of putting them in a navigation center, which is a place where a person can only stay for 90 days, and then you lose track of them, and they end up outside on the street, homeless, all over again. 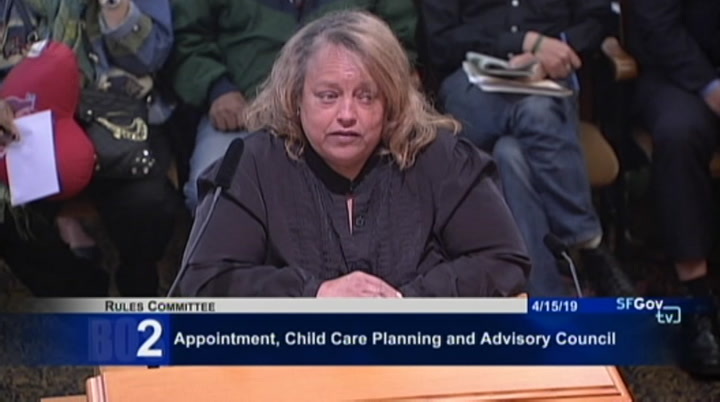 for child care. and i really think that we have opportunities to do some really great things. so this is a cary room righscary roomright now. 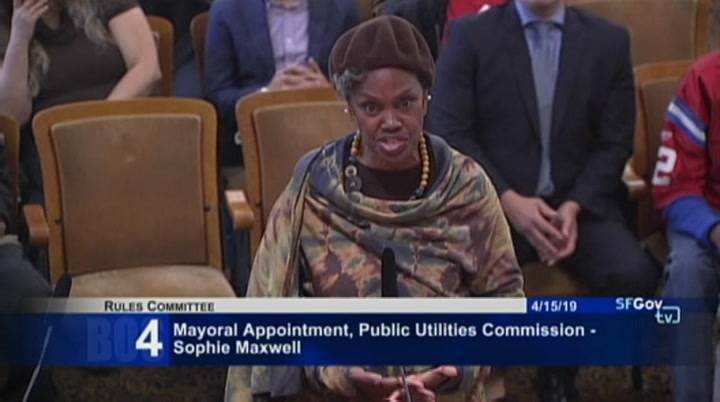 >> chairwoman: i know. it is really busy right now. ms. clerk, do we have an overflow room? >> i believe media services is setting up an overflow room in the south light court. 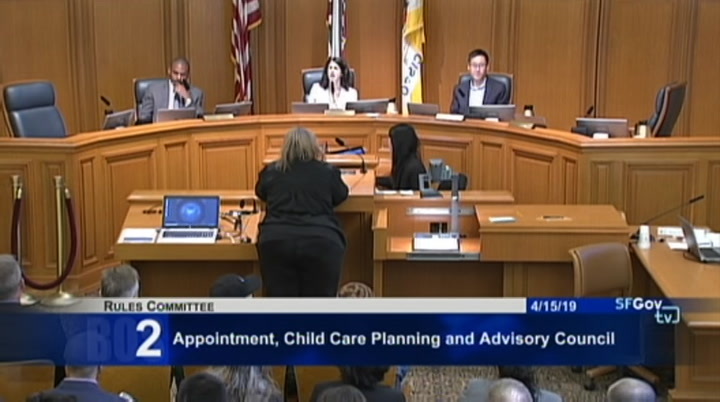 >> chairwoman: if you are standing up, we have a couple more items before we get to item number six. we usually don't allow for so many people standing. there is a tv station, and we'll give you time to come back up for public comment in the south light court. you should feel free to go there. thank you. thank you so much for your patience. are there any questions of ms. sullivan? none? thank you so much for your willingness to serve. >> thank you. 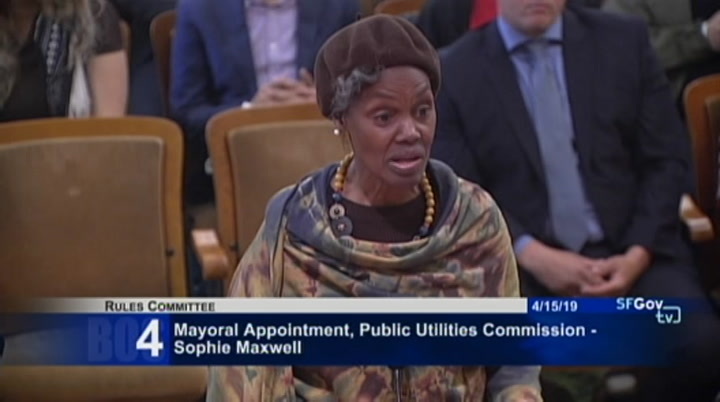 >> chairwoman: is there any member of the public who would like to speak on item number two? actually, the general public gets this and really wants this type of basic oversight. 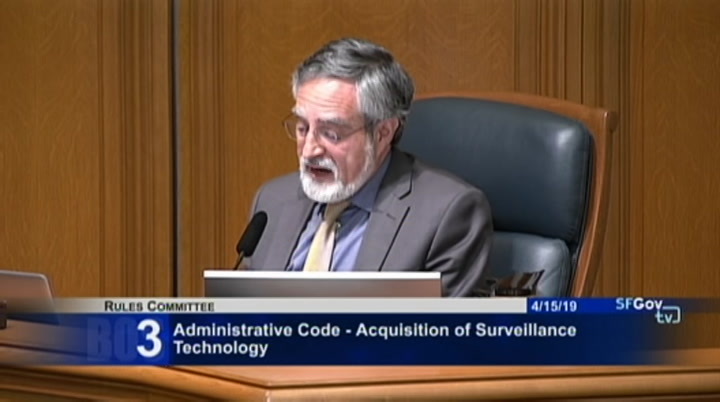 the voters said as much last november when 70% of san francisco voters approved proposition "b," the privacy first policy, in san francisco. 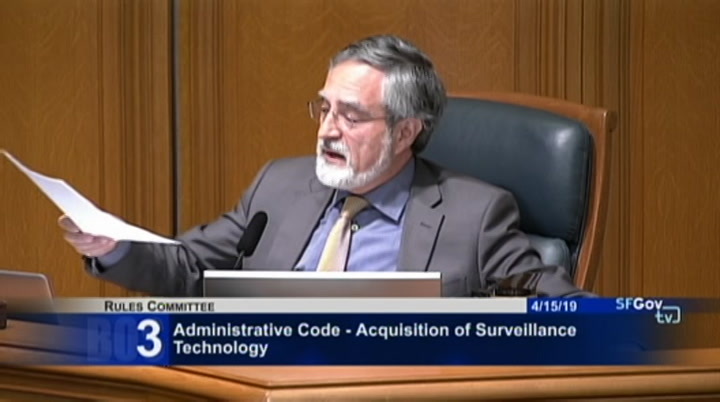 a set of policies to protect the personal information of our residents and voters. and a poll just done by the american civil liberties union just revealed that 76% of voters state-wide and voters in the bay area, support a law to require public debate and a vote by lawmakers before any surveillance technology is obtained or used by government or law enforcement. i would like to put that in the record, if i could hand that to the clerk. and, colleagues, i have copies for you. 79% of voters disagree with government being able to monitor and track a person using bio-metric information. we have received a number of comments in the last few days. actually, we have received a lot of comments, and there are letters in the file, and i want to thank the aclu of northern california and the folks at extraordinar secured justiced the coalition on homelessness, the council on american-islamic issues, faith and action bay area, green line institute, the harv harvey milk club, justice for mario woods, national center of lesbian rights. open privacy, san francisco democratic sobristsocialists of america, te transgender law center, i'm sure i've missed some from the letters they have in the file. but we received,sall of us, since about friday or thursday, a number of e-mails alleging that this legislation has been rushed. 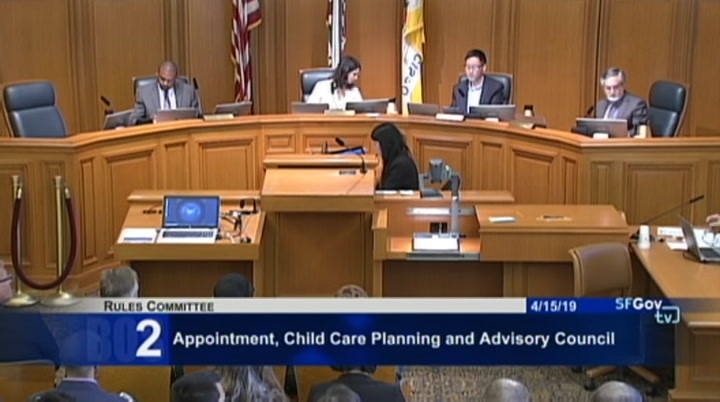 and i just want to clarify that this policy was introduced over two and a half months ago, and has been the subject of extensive reporting in virtually every local publication from the chronicle to the examiner, s.f. weekly, and the public press, and national and international press from the u.k. guardian to the atlantic. we've also heard from a lot of department heads, and i want to thank the various departments who have reached out to my office. and today i'm going to introduce a broad set of amendments. some of those are still in front of the city attorney and need to be approved as to form. i, quite to the contrary, do not want to rush the process. i'll introduce those and speak to those today. that will require a one-week continuous. 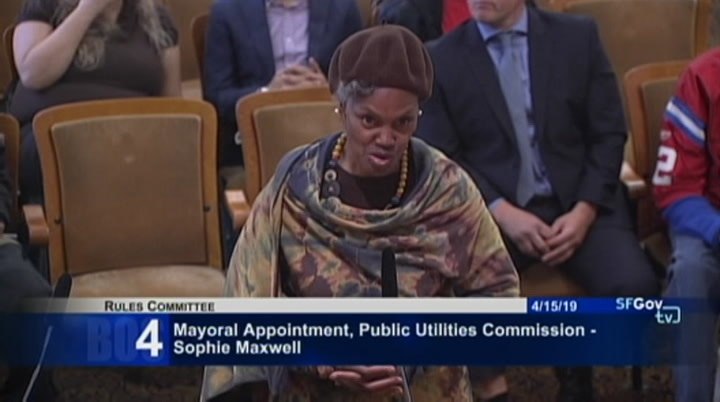 at that point they will be approved as to form and to be continued -- i'm sorry, madam chair -- to a third public hearing. 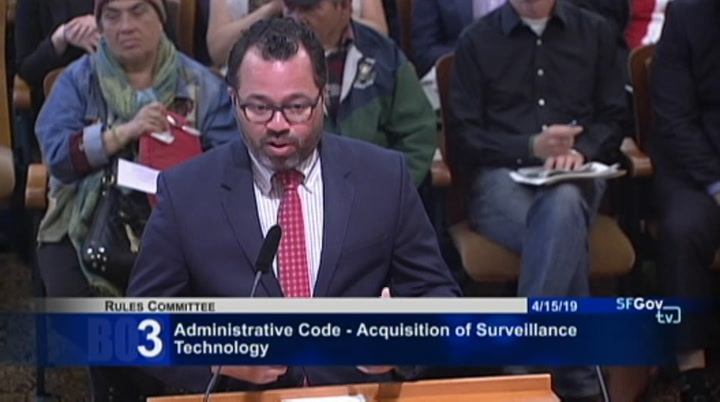 with those discussions within the city, through a wide array of departments, my office took the step of presenting this before the committee on information technology at a public hearing in march. and i really want to thank not only my staff, lee hepner, who has been working very, very hard on this, and i want to publicly acknowledge mr. hepner for his work. 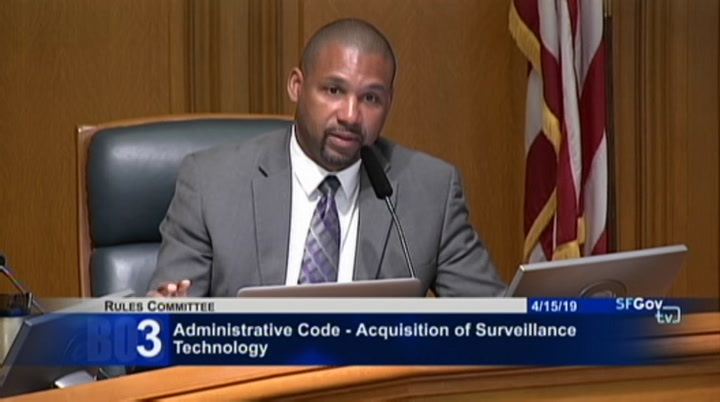 but i want to thank in particularly bill barnes for helping work with the departments that would be impacted by this legislation. so with that, i can go through the amendments. 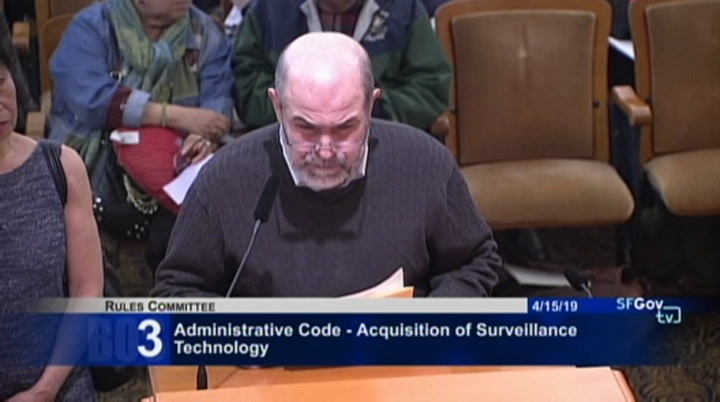 of surveillance, but serves valuable information. and when we're trying to maintain the safety and security of our buildings. we're a major metropolitan area. 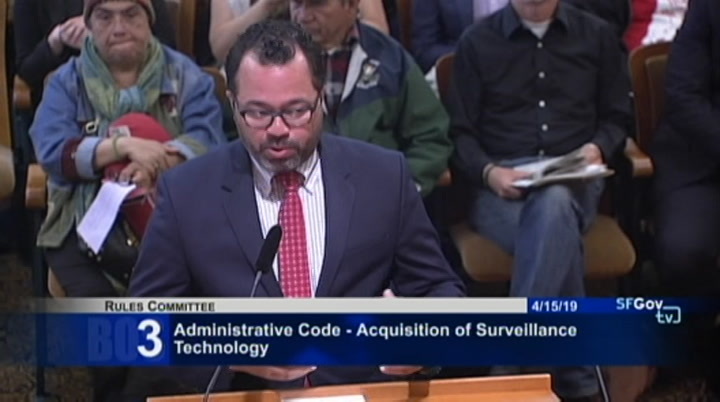 we want to make sure if we see something, we say something. 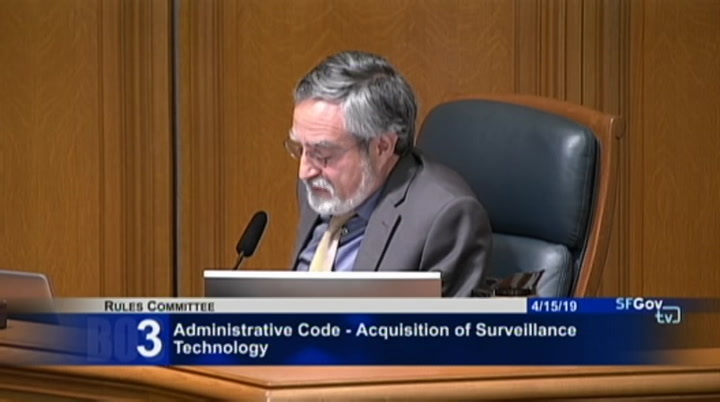 so those sorts of uses were actually also excluded in the legislation that the supervisor put forward. 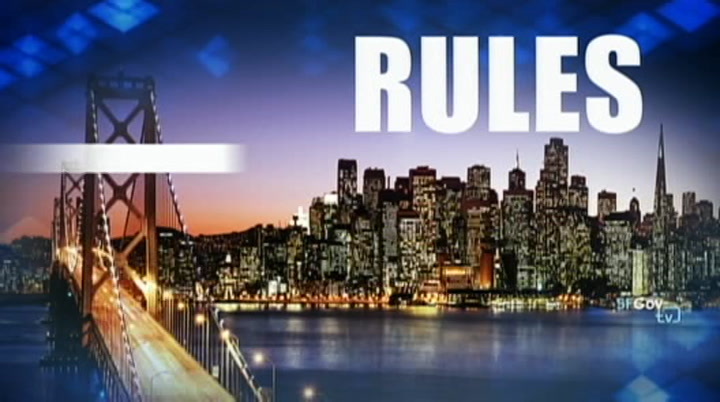 while there will be some examples that some people disagree on, and some people say maybe we shouldn't allow this or have rules, there are many, many more that are used by the departments that serve the basic functions of the city. coit will review everything. the departments would have to report to coit on what they currently do. that will give us transparency on what is out there and then we can have the discussions. lastly, this will be continued not just once but twice, so we reserve the right to come back with additional thoughts. we would like to thank the author for his help. thank you. 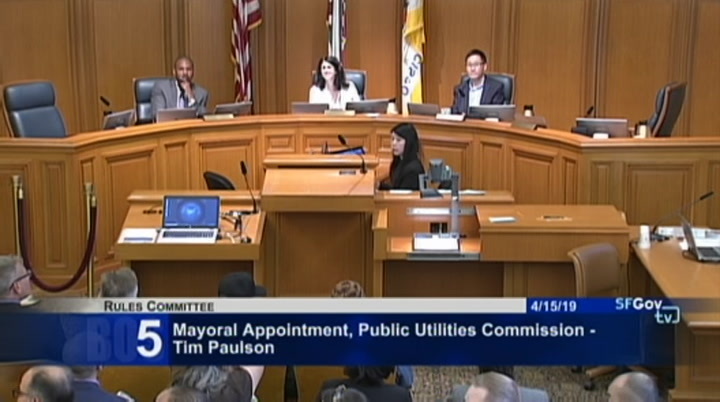 >> chairwoman: thank you. and explain what those uses are, what the plans are. the last thing we need is a rogue city department preaching a tool or policy that ends up violating the rights of individuals, because that never happens. we know it is not true. 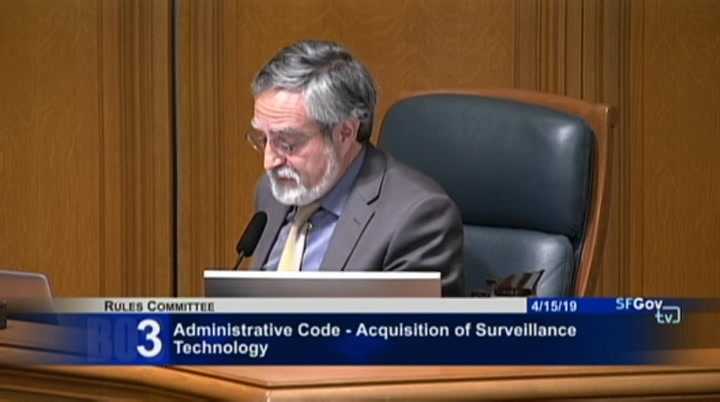 this does allow us to vet the unintended consequences of using certain surveillance tools. 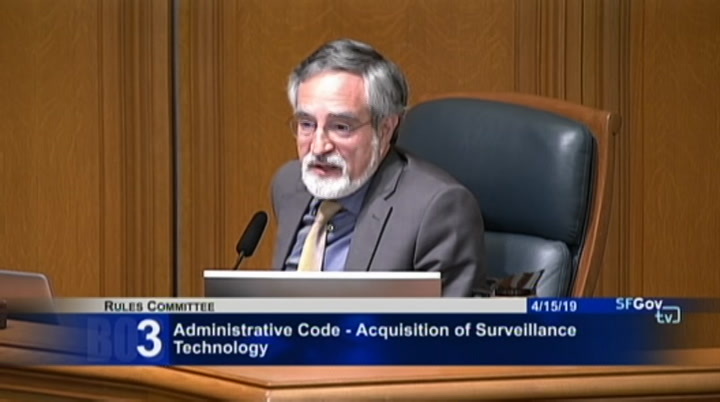 it protects individual rights, but it also protects the city from any litigation that could come from any such violation of rights, so it is important that we make policy that is good for the city as well while we have the conversation about how we use technology to keep our community safe, and again, i want to commend supervisor peskin. a lot of leadership from city departments working together on the amendments -- amendments. i know some changes were needed to make this the best legislation possible. that is why we will continue to have this conversation. i wanted on the record that this is thoughtful legislation. we have not rushed to how this has been formulated. as you can see by the number of hearings and the many times they have brought this year to the body. thank you again to supervisor peskin. i just want our community to know that safety is first and foremost, but we have to protect rights as well. >> thank you. if there's no other comments from my colleagues, i would like to open this up for public comment. i have a bunch of speaker cards, and i will call out a few names. i know this room is very crowded again, there is an overflow room , but i will ask people whose names i call to sign up to my left or right.